All cottages and cabins have wood-burning stoves except where noted. In need of some time away from home with the kids? This cottage is perfect for all your needs. Three bedrooms; one which has a queen bed, one with a double and one with a double and a bunk, there is even a efficient bathroom with a vanity sink, toilet and combined tub/shower unit. Oh! Is that?? Yes! A kitchen with combined dining area and a casual seating area. And… there’s more? Yup! There’s also a screened in porch for a breezy entry. Sleeps up to 8 people. Big but still small enough to be called a cottage, this three bedroom cottage could be a mini house. A spacious open concept kitchen/dining area opens onto a newly built deck equipped with patio furniture. Sleeps 8; 1 bedroom has 1 double bed, another has two doubles and the third has two singles. Also has a four piece washroom with vanity sink, toilet and combined tub/shower. A wonderful three bedroom cottage on the beach… a screened in porch with a couch and chair for relaxing… a fully furnished kitchen/dining room, a complete washroom with combined shower and tub... everything you could possibly need for an enjoyable vacation with your family. Sleeps 6 with 2 double beds and 1 queen. Looks can be deceiving, right? Well from the outside this cabin may look pretty rural but the inside is fully furnished with everything you could possibly want. Enter by way of a screened in porch overlooking the docks and go into a spacious kitchen/dining area. Three bedrooms but can sleep up to 08 people! Two of the bedrooms have 1 double bed, and the third has a double and a bunk. But that’s only 8! Wait, there’s more! Also has three piece washroom with vanity, toilet, and upright shower. Cabin 5, 6 and 7 are all authentic log cabins original to when the rail roads were built. They are over 100 years old! Just married, looking to have a second honeymoon, or just looking for some time away from the kids? Come stay at our romantic honeymooners cabin. A hundred years and this rustic one room log cabin is still as good as ever. Located right beside the lake, it contains a double bed, kitchenette with cold running water, table and chairs and a couch for relaxing. Central public washrooms have showers and washrooms. Come relax in a hundred year old pristine log cabin with a view of the lake from the front porch. Outfitted with two bedrooms, each with 1 double bed, it can sleep up to 4 people. A combined kitchen and dining area features a cozy woodstove and cold running water. 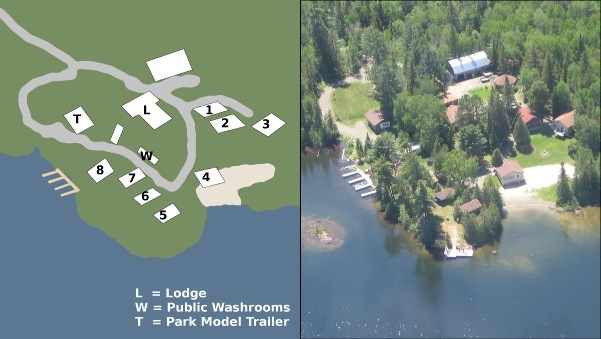 Showers and washroom facilities are available in the central public washrooms. This duplicate to Meadowlark Mansion, this is a hundred year old pristine log cabin with two bedrooms and a combined kitchen and dining area. Welcome to a beautiful trailer. It boasts of two bedrooms, a living room with lots of casual seating, a kitchenette/dining area, a bathroom and even a covered deck! Although is only has two bedrooms this trailer can sleep 6 people. It has a double in one bedroom, a bunk in the other, and the couch in the living room folds out to be a double as well! The bathroom has a vanity sink, toilet and combined tub/shower unit.